Replacing pool liners is part of pool ownership. 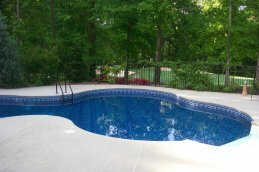 Vinyl inground pool liners can last up to 8-10 years depending on how much UV light it's exposed to and how well the pool chemicals are balanced. Selecting one that you will be happy with requires a little bit of knowledge. Depending on the use of the swimming pool and how well it is maintained, you can expect to enjoy your pool liner for many years. However, the time will come - like it did with us - when you've done as much repairing and patching as possible to delay the inevitable - spending lots of money to replace the darn thing. Try to repair small leaks or holes in your liner with a swimming pool liner repair kit. We did this several times and we were able to extend the life of the liner by one more season. However, this year we got a 3 foot tear just above the water line. This is the spot where the liner gets the most sun. When it is time to replace your pool liner get at least 3-4 estimates. There was quite a range in the price estimates - with a price difference of $1500 between the highest and the lowest estimate. So when you are about to spend several thousands of dollars it's time to do a little research. We also found that a couple of companies wanted to charge $85- $100 to come out and measure the pool. The cost for measuring would then be deducted from the price of the installation. But we choose to use companies that didn't charge us for an estimate. Most installers require half of the payment upfront before ordering the liner and the remainder is due when the job is completed. When is the best time for replacing pool liners? We developed a large tear at the end of the summer and we knew that it was time to replace the liner. However, we did get it patched, and although it didn't look great, it didn't leak. My thought was why have a brand new liner that will be sitting there unused but also getting wear and tear from chemicals and the sun for almost 9 months? So we delayed and had our vinyl swimming pool liner replaced in the spring - April to be exact. Now, it's important that you get your name on the list early so that you can get your liner replaced before your swimming season starts. We found that our pool liner replacement company had a really busy spring and we were 7 on a list of more than 20. Others who were on the bottom of the list didn't get their new liner in until the end of May or early June. Choosing pool liners is a big decision as you have to live with your selection for many years. It's difficult to picture what your pool will look like from a small sample piece of vinyl. Ideally, if you have friends or neighbors with pools, ask to look at their design and what they've liked or not liked about it. Our first vinyl design had a lighter colored bottom that has faded quite a bit from the chemicals and our frequent use of stain removers due to lots of leaves in our pool. This time we choose a darker design that won't show stains as much. When replacing pool liners do not choose a liner with a solid color. The solid color will show more stains. When a solid vinyl pool liner discolors, it will discolor unevenly and be more noticeable than one with a pattern. Replacing pool liners involves many steps by the right installers. We had our liner replaced in the spring and here is what happened. First a pump is placed on the bottom of the pool to drain the pool. Our swimming pool liner installers came the day before they were going to install the liner. The pump started running around 6:00 PM and ran all night. We knew that we needed a new liner. Our 10 year old liner had many small leaks, but then we had a 3 foot tear at the water line at the end of the summer. A large white piece of vinyl covered the tear so that the pool didn't leak. Meanwhile, we thought it would be smart to install the new liner in the spring, rather than the fall since we wouldn't be using the pool anyway. So we winterized the pool and thanks to lots of trees around the pool, there was quite a mess to clean up. Before the new liner can be installed all the plates need to be removed. Later the vinyl will be cut out. Our contract included all new plates and skimmers - the new white ones sure look good! The new liner goes up and we are loving the new darker pattern and the top tile design as well. The vacuum runs for hours so that the liner has a really smooth finish without any wrinkles. Nice white plates and skimmers add to the fresh new look. Our steps were still in good condition so they didn't need replacing - but if your replacing your pool liner this is a good time to change out the stairs as well. The time to perform your pool light replacement is when you are replacing your inground vinyl swimming pool liner. After several years these lights will start to leak and some will rust. Even though one of our two underwater pool lights were still working, we had new halogen bulbs put in all of our lights. Our installer showed me the burned out halogen bulb. When I told him that we didn't use our underwater pool lights that often, he explained that because they get so hot, sometimes they just blow from the heat and not from hours of use. This one from Amazon has a stainless steel face. It comes completely assembled including the light bulb and the waterproof cord.